Lifeliqe, a platform for interactive, educational 3D, virtual reality and augmented reality, today launched Lifeliqe Creator, a program that gives teachers the power to create and publish interactive presentations and e-books that integrate 3D models, rather than 2D images. Lifeliqe users can explore objects — such as dinosaurs or the inside of a shark — with interactive 3D views. They can zoom deep into the structure of objects, experience augmented reality, view supplementary text on a subject and change the language for a bilingual view in English or Spanish. With the Lifeliqe Creator feature, any of the 1,000 interactive 3D models can be dragged and dropped right into a presentation, e-book or lesson plan, so teachers can provide students with interactive 3D experiences. Lifeliqe spent three years creating its library of virtual content for schools, the company said in a statement. Featuring content from its sister company Corinth, Lifeliqe offers K-12 educators realistic 3D models accessible on tablets, PCs, interactive whiteboards and in VR. In addition, Lifeliqe integrates with Keynote and Powerpoint. LIfeliqe’s models are focused on STEM subjects such as human, plant and animal biology, geology, paleontology, physics, geometry and chemistry. More than 15,000 teachers, students and parents in more than 100 countries are currently using Lifeliqe’s digital content, the company said. Recent studies suggest that students learn and retain information better when they use 3D learning materials. All of Lifeliqe’s content is scientifically accurate, the company said. 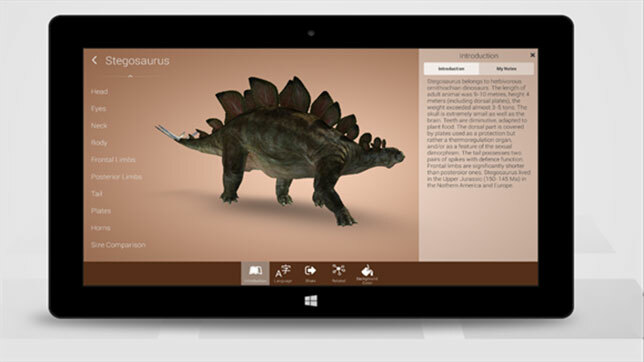 Lifeliqe is available for free download on the iTunes app store and the Windows store. The initial trial is free.